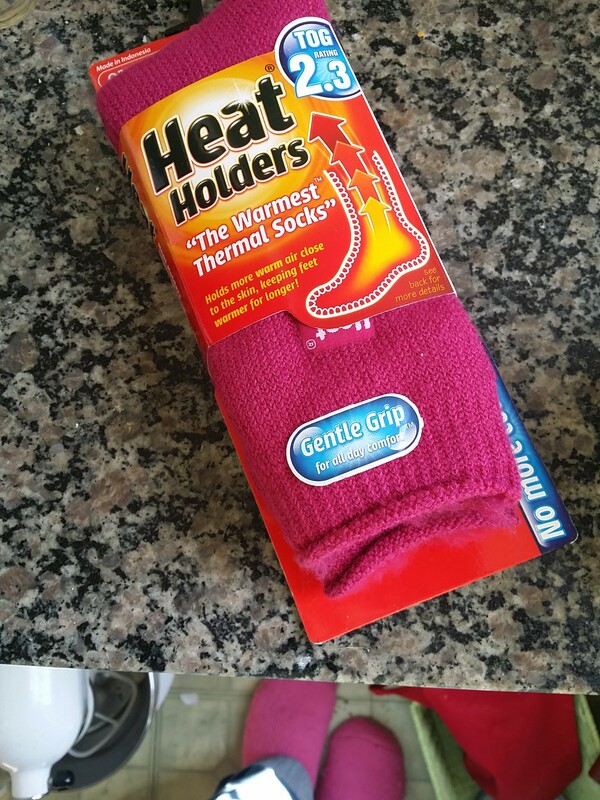 Since it looks like winter is not coming to an end anytime soon, I figured today would be a great day to talk about these wonderful thermal socks by Heat Holders, that I received a couple of weeks ago. If I had to describe them, I would say that they are a combo of cable tights and sweat socks, and YES men can wear them too. I just happen to have a pair in magenta, but it you’re cool, then I’m cool. Frostbite knows no gender. With Chicago days having more than twenty below zero degrees this season, these came just on time. They are super soft on the inside and provide an extra level of protection that regular socks haven’t for me in years. The only unfortunate thing for me at the moment is that they ONLY fit in my boots and one pair of gym shoes. I’ve shoveled in them and I even sit around the house in them during work days because I dare not crank the heat up any higher than what it is, or I shall no longer be known as Houseful Of Nicholes, instead, it will be Sidewalk Full of Nicholes. *side note – WHY in the name of all things holy is is so darned expensive to use your heat? * After coming in from shoveling (the one time that I did it this season) I must say that my toes were NOT frozen, and I didn’t have an immediate need to go and stand on our heating vent. The only issue that I have is with the fuzzing after multiple wears, but it hasn’t altered the integrity of the warmth of the socks AND I don’t have sock lint in between my toes. You care, I know you do. Heat Holders also makes tights, hats, gloves, and thermal underwear. It’s an entire family of warmth! With that being said, I know that you all definitely want a pair to defend your feet against the cold wind, ice, snow and water. It’s necessary, and since most people get extra cold when their feet are cold, why not give your feet a better line of defense? So I’m here to offer you a chance to win your very own pair of Heat Holders Socks! Enter through our Rafflecopter and a winner will be chosen one week from today! The first entry option is mandatory, all others are optional for extra chances to win! Congratulations to Danielle Jones on winning our giveaway! Thanks to everyone for entering, and be sure to check out Heat Holders for all of your warmth needs! Even after a “heatwave” here in Chicago, we’re going to NEED this for a little while more! My feet are always cold. Always. Gotta protect those toes. These sound like heaven for someone like me. Since I suffer from a disease that I have to take blood thinners for I am always cold and my feet are always the coldest. Aside from tripling my socks and covering myself with a blanket I find no relief. Hoping that these socks do the trick. No more wearing 3 pairs of socks to get my feet warm again. I know just got happy saying that. Angela Herrera liked this on Facebook. My hands and feet need protecting because I have Raynaud’s. My arms stay colder than anything during this time of the year. This would help protect my toes, which are my most vunerable part. I try to keep my feet warm. I have a thyroid problem so their always cold.